After crossing the Macedonia – Kosovo border we headed straight towards Pristina where our first stop was the UNESCO-listed Gračanica Monastery, a Serbian Orthodox monastery constructed on the ruins of an older 13th-century church and located a few kilometres outside of Pristina in Gračanica village. The church within the monastery is full of well-preserved frescoes dating back to the year 1321 which are best seen with a torch in order to light up the interior’s dusty darkness. 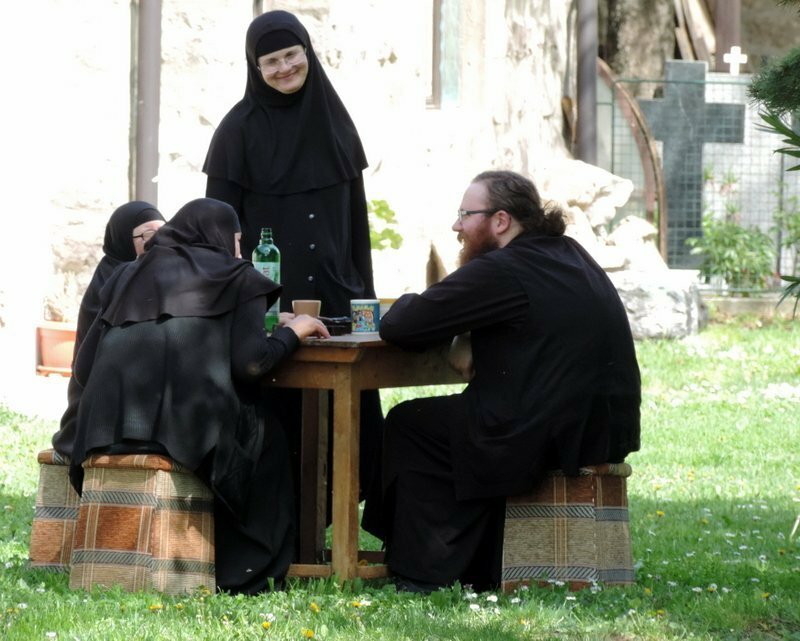 The monastery currently serves as a convent housing a community of nuns who also work within the surprisingly tranquil oasis. A man who wore a tag saying “monitor” and who spoke excellent English spent some time explaining the history of this church to us as well as the meaning of the different frescoes which we found really interesting. 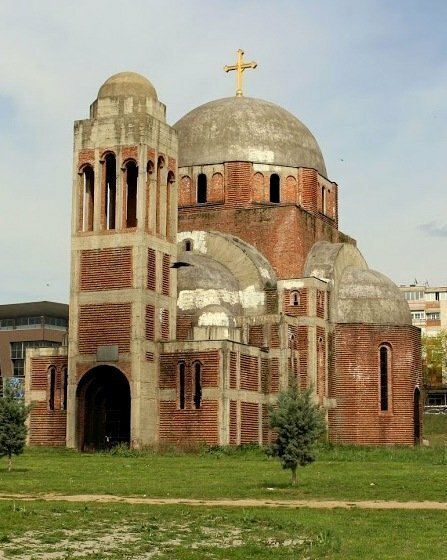 He passionately pointed out the differences of this structure to other Orthodox style churches, particularly the frescoes inside its four domes each of which is dedicated to one of the four evangelists. Another cool feature of the church is a secret, hidden, narrow stairway allegedly used by the queen to access her private area. 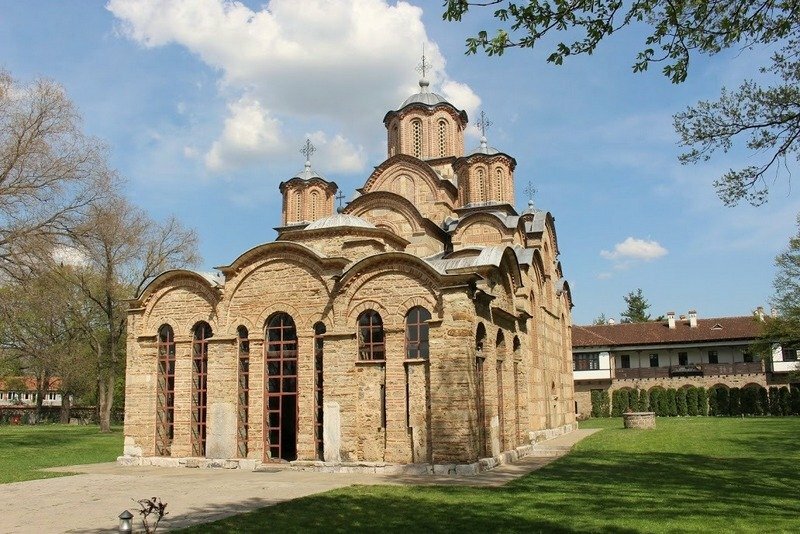 A short visit to the monastery is highly recommended especially if you are travelling to Pristina by car. No photos are allowed inside the church. Our GPS then guided us to the city centre of Pristina. We managed to find a parking spot on Bill Clinton boulevard hoping to spot one of the city’s highlights – a three-metre high statue of Bill Clinton. Luckily we managed to park very close to it, underneath a massive old poster also of Bill Clinton. 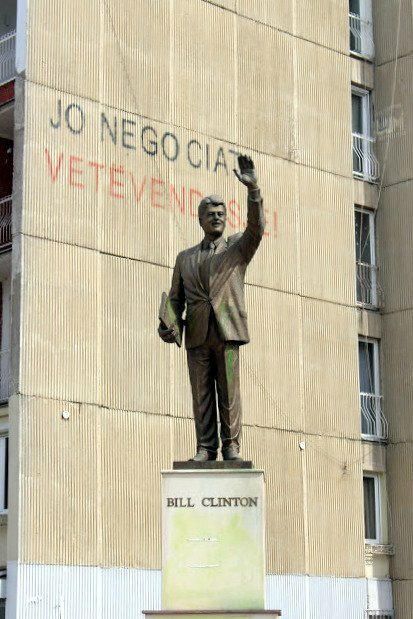 The ex-American president seems to be well-loved here presumably for his support of the territory during the Kosovo War in 1999. It may be no coincidence that a few metres away from the statue there’s a shop called “Hillary” – no trace of “Monica” though! 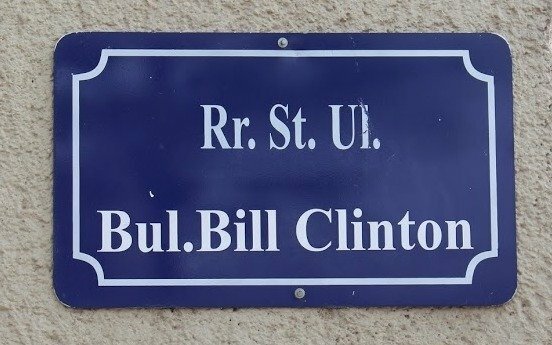 Bill Clinton is beloved in Pristina! 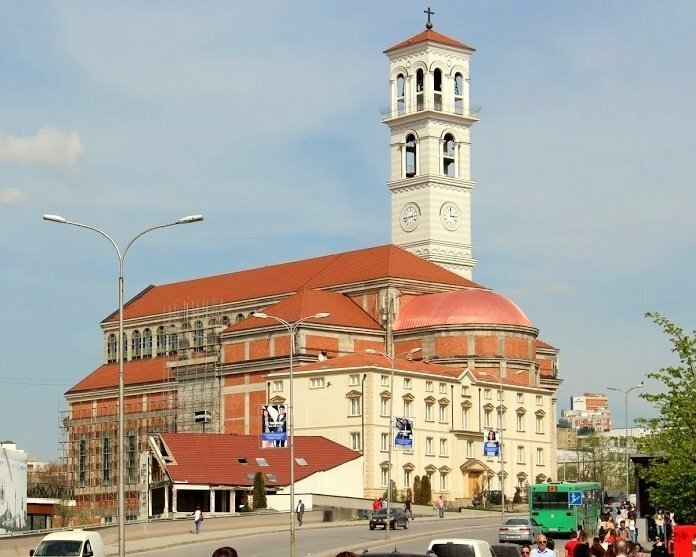 We walked further up the boulevard to take a look at the Nene Tereze (Mother Teresa) Cathedral but we did not go up its clock tower from where you can apparently enjoy a panoramic view of the city. We then went on to try find the National Library which I was curious to see since I had been told that it looked really weird. No kidding! It made me think of partly-hatched alien eggs. For the record, Nikki liked it though. 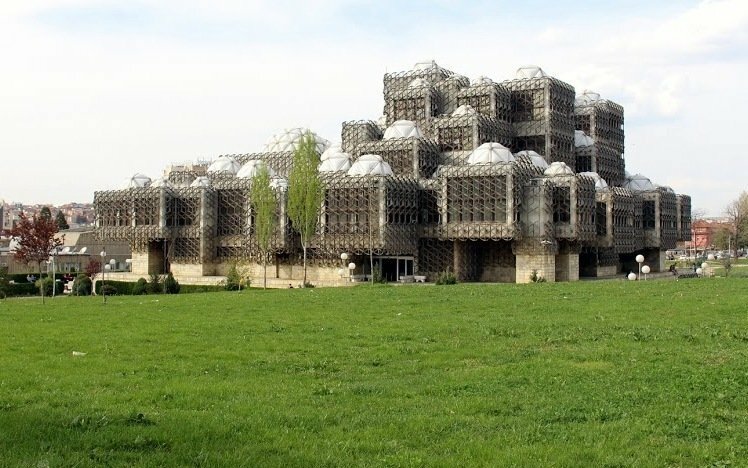 Right across from the library lies the unfinished Serbian Orthodox church of Christ the Saviour which was never completed due to its construction being halted by the Kosovo War and which completion has now become a somewhat sensitive issue due to tension between Serbs and Kosovars. Finally it was time for a macchiato and some people-watching in one of Pristina’s many cafes. 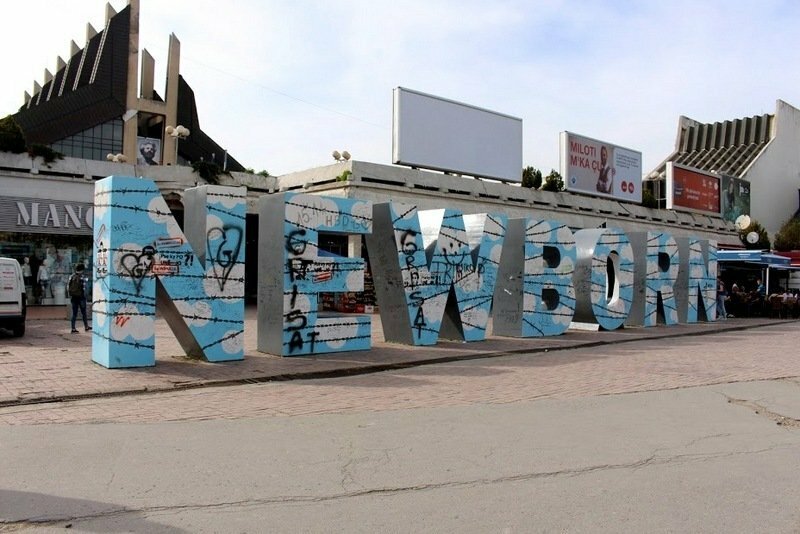 That’s when we realised that Kosovo’s population is really young! Free wifi was available in the area we were in, but was really slow. Then again, so was the cafe’s own wifi… actually we later found out that wifi connections are terrible almost everywhere in Kosovo. The Newborn monument located in front of the Palace of Youth and Sport symbolises the birth of Europe’s newest country. The monument is re-painted differently every year, and this year it is coloured light blue with white clouds and barbed wire which we were told signifies a nation-wide feeling of isolation. Although not very large in size, I felt that it sent out a defiant message. The Heroines monument, a tribute to female victims of sexual violence during the Kosovo war can be found opposite the Newborn Monument. All in all we felt that Pristina was an interesting little city but lacks any form of grandness typically found in other capitals. Although we are glad to have visited and discovered it, we enjoyed Prizren more.